(April 8, 2015, The Condor: Ornithological Applications)—Collisions with birds are one of the most common hazards to aircraft, causing $700 million in damage annually in the U.S. A study published this week in The Condor: Ornithological Applications may have important implications for reducing bird strikes through the customization of aircraft and runway lights to birds’ visual systems. Megan Doppler and Esteban Fernández-Juricic of Purdue University and Bradley Blackwell and Travis DeVault of the National Wildlife Research Center’s Ohio Field Station conducted experiments involving captive cowbirds and remote-controlled aircraft to test how the birds reacted to a variety of lights. Birds’ eyes are different from human eyes in several key ways, and Doppler and her colleagues determined that blue light (light with a 470-nm wavelength) would be most conspicuous to the Brown-headed Cowbirds (Molothrus ater) used in their study. Outfitting a remote-controlled model airplane with lights in this color, they tested how the captive flock reacted to continuous versus pulsing lights and to a stationary versus approaching aircraft. When the aircraft was stationary, cowbirds became alert more quickly when the lights were on than when they were off. When the aircraft approached the birds with lights off, their response times slowed as the aircraft’s speed increased, but lights helped mitigate this effect. The authors have several suggestions for applying their findings to real-world situations. Stationary lights along runways could by synced with taxiing aircraft to help capture birds’ attention before aircraft take off. Lights onboard the aircraft could be off during taxiing but on during takeoff itself to improve birds’ ability to detect and react to such large, fast-moving objects. With some tweaking, similar approaches may even be applicable to reducing bird strikes with large stationary structures such as towers and wind turbines. In any case, selecting lights based on their conspicuousness to birds’ visual systems may be an important step forward in reducing one of the most common and hazardous human–wildlife interactions. A figure from the paper lays out the setup for the model aircraft experiments. 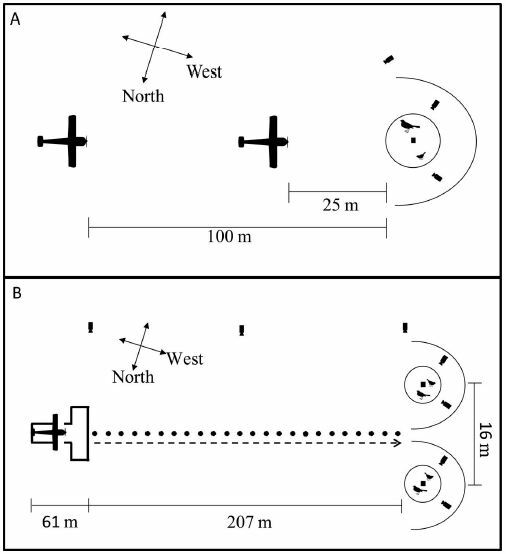 Cowbirds responses to aircraft with lights tuned to their eyes: Implications for bird-aircraft collisions is available at http://www.aoucospubs.org/doi/full/10.1650/CONDOR-14-157.1. Contact: Esteban Fernández-Juricic, efernan@purdue.edu.